Brian Monty Bluesmaster in Excellent “-“/VG”+” Condition with Original Hardshell Case. 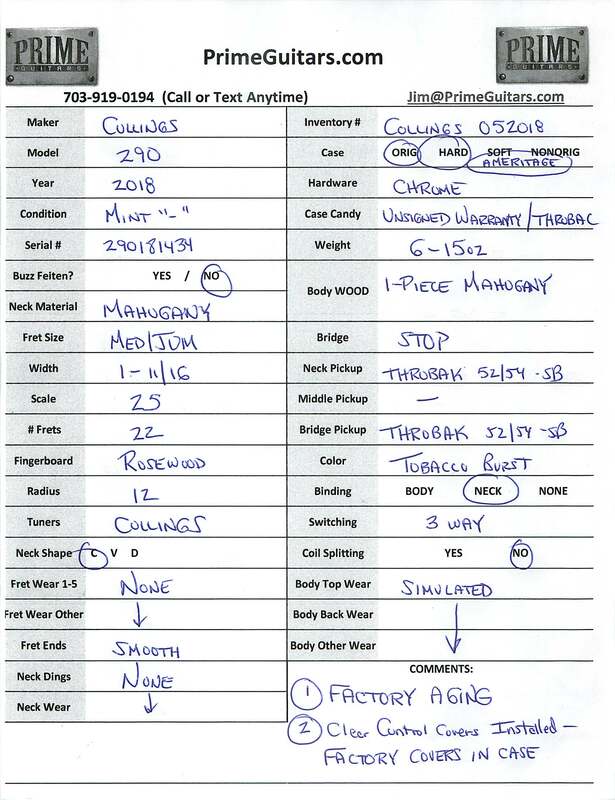 This is from a nonsmoking environment and has no major issues but some play wear outlined in the Spec/Condition Sheet (Please see pictures for the Sheet). The key to this instrument is how woody it sounds. Brian makes each guitar himself and uses select hand chosen woods. He finishes each in a thin nitro to allow the woods to breath and the tone to flow. I am aware that Brian is the subject of an upcoming article in Vintage Guitar Magazine because his work is renowned amongst those who search for modern masterpieces. Rare 2005 Gustavsson Bluesmaster. This is an extremely early and highly desirable version. People hoard the early JGs because they are regarded as the best era for this handmade instrument. I have sold over 4 DOZEN JGs so there are few people with more experience. 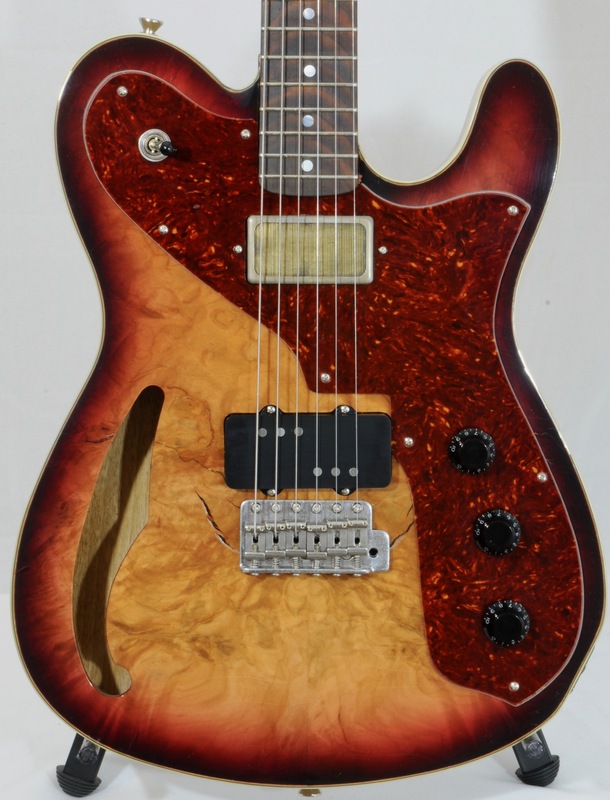 A select few have a wonderful warm fat midrange..,…THIS ONE DOES. I can tell you from experience that every single one of these guitars sounds quite different. If you are spending this much money on a guitar, please take the time to find the right one for you. Yes they are all good sounding….but they are all different. Take the time and ask the seller about their guitar….and watch out for bs like ‘it’s like a great burst’ or ‘it blows away my r9’. That doesn’t help you does it? Maybe their R9 is scooped sounding and this is less scooped and you want a mid-hump. See my point? So this piece has some light wear (see the spec/condition sheet in the PICTURES) for all the details. No major issues in my mind but if you want mint then this is not for you. 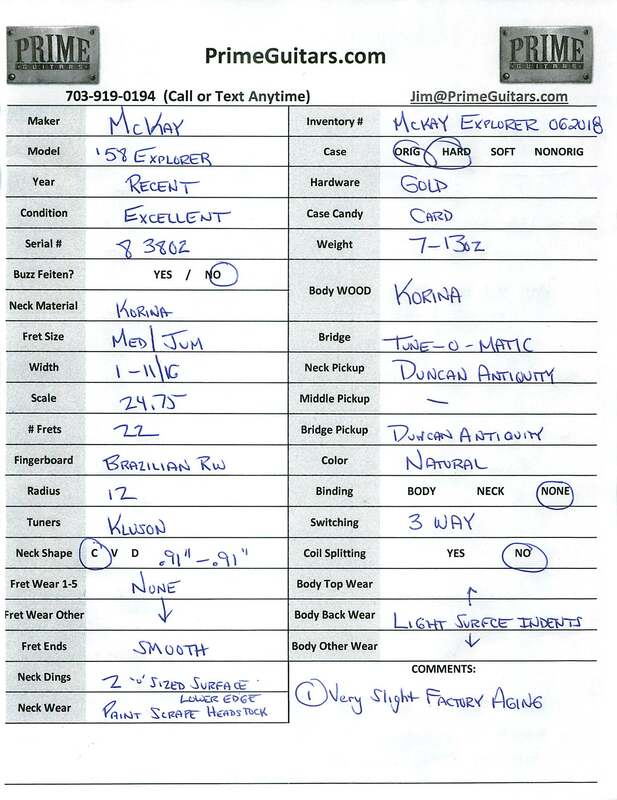 I try to describe my items accurately and take more time than any other seller to prepare a detailed document with weight, wear, and the best specs I can determine for each piece. My feedback should assure you that the overwhelming majority of buyers agree. Victoria Bassman a.k.a. 45410 in Near Mint nonsmoking original condition. New these are $2900 and this one is super clean. You can see by my hi-res pictures that it was a home only use piece. Tubes look as clean as the rest of it (i.e. it’s not been played much if you haven’t already caught my drift). These amps are just wonderful. I’ve had many and they are consistent tonally. They just capture that vintage Fender tone in an affordable format. New these are amazing deals…USED and in THIS condition you should jump on it. Think about it. The other guy already took the price hit. You can enjoy this one and move it along and likely get pretty much what you paid (or more). IF you’ve ever lusted after this amp….or if you just want to take a flier on a new amp…this is the way to do it. Impossibly rare CUSTOM Homestead Hundred. This one is a 1-off specially made by Peter for a good customer. 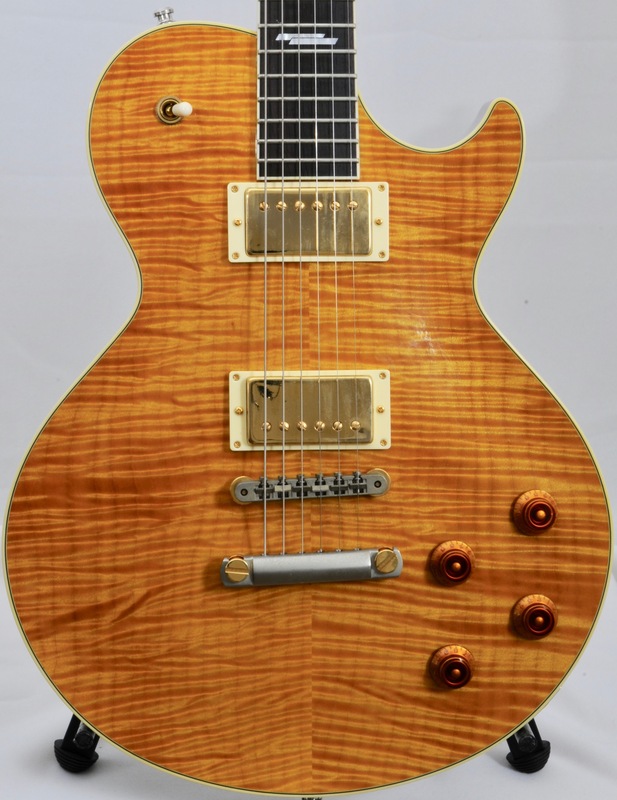 This one has an Effects Loop….the only other one with a loop is the one Warren Haynes has. This also has 6550 tubes. YES IT HAS A FOOTSWITCH (not pictured but included). VERY low hours and nonsmoking ungigged and unmodded. This comes from one of my best customers who purchased this amp then ran into sudden new home repair costs. You can get one that has major upgrades for less than the price of a new one. Search Youtube and you can hear clips of this amp. It is a WOW piece. Simple but WOW. 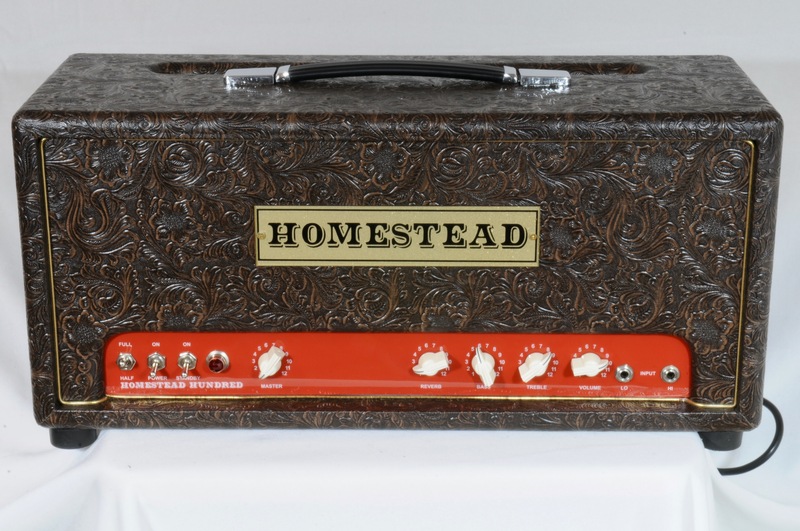 Get in on the ground floor of these Homestead Amps….they are the real deal. 2018 Wysocki Tele : Just 5lb-9oz – ANCIENT Woods! Larry Wysocki is THE “Go TO” guy for woods. He has been doing this for 50-years. All the major builders go to Larry when they have a high end order and need special stuff. Larry picks the best of his stash for the few custom guitars he personally builds each year. 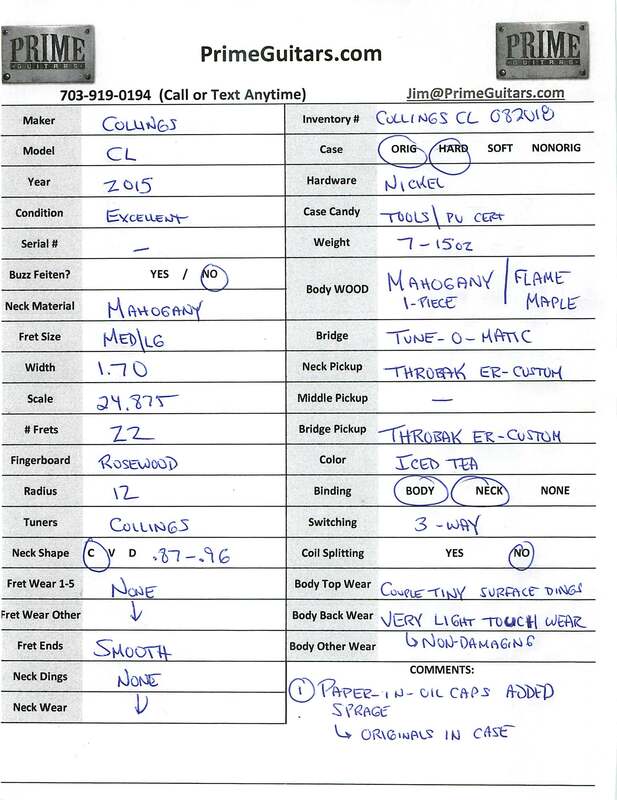 Larry scours the planet for the finest timber…..and YOU get the best of the best. 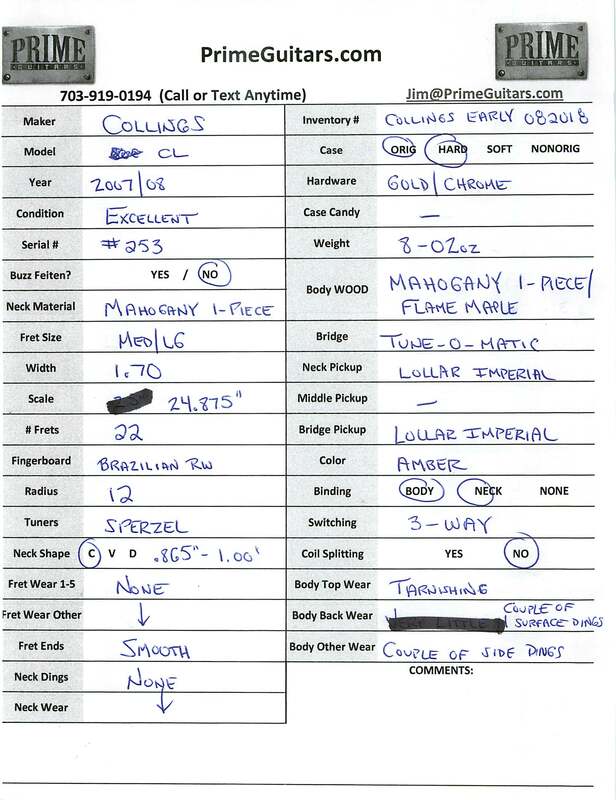 A D’Pergo with these specs would be (are you sitting) close to $20k…yup….and they can’t get this wood. Larry has built guitars for major artists. He typically only sells directly to A-list guys. It is extremely rare to acquire a Wysocki new. I am thankful for my relationship with Larry and hope to continue our friendship. I have sold several Wysockis already…they have gone to folks with all the big names. I have consistently heard that the Wysocki beats them all. 2015 Collings CL with THROBAK PICKUPS! This guitar was also professionally upgraded with NOS Sprague Paper In Oil Caps (originals in case). The instrument is in EXCELLENT Nonsmoking Condition and of course comes with its original hardshell case (Ameritage). It weighs just 7lb-15oz and features a 1-piece Mahogany Back! The neck is a perfect “C” Shape that measures .87″-.96″…for those who don’t translate…this means it’s slightly more comfortable than a 59RI Les Paul. The nut is a touch wider than a LP too at 1.70″ which means you have just a hair more room to bend comfortably on the 12″ Radius Neck. VERY clean piece and you can see by our feedback that our instruments arrive as advertised. 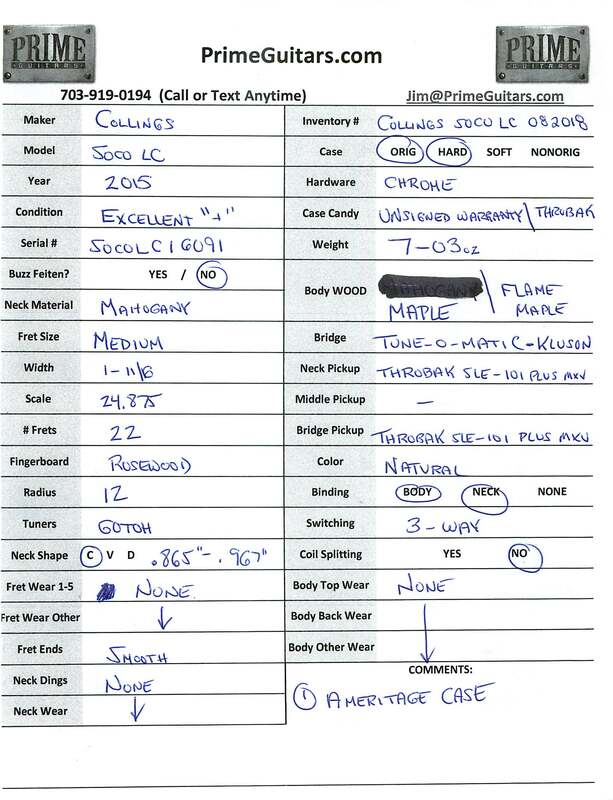 PLEASE SEE THE PICTURES FOR A COMPLETE SPEC/CONDITION SHEET. We are the only ones in the business who take the time to go through an instrument and provide this level of detail. 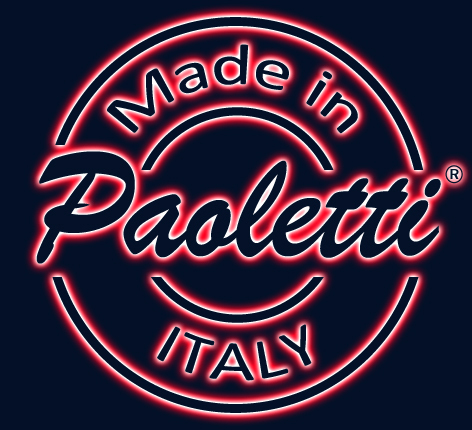 The result, buy from a store, with a fantastic reputation….and get what you expect. 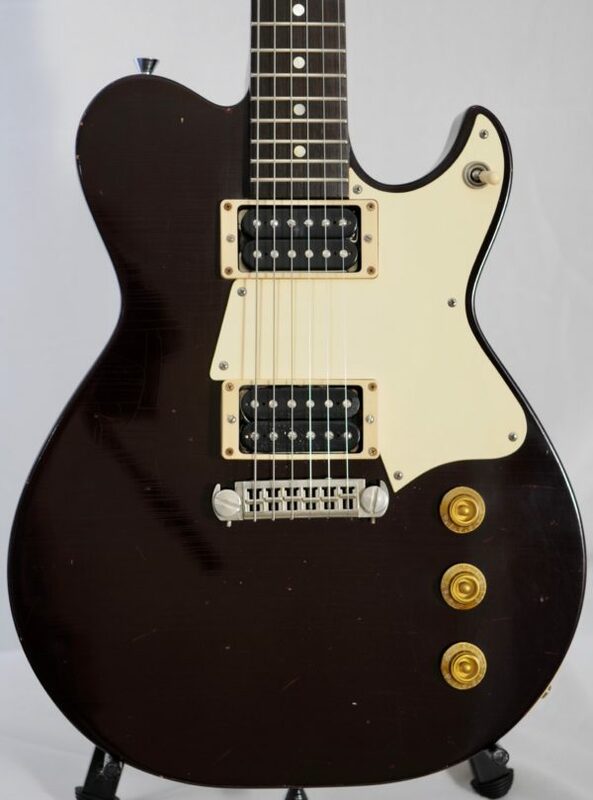 Collings Soco LC in Excellent “+” Nonsmoking Condition. 1-Owner lovingly cared for and barely played. Comes with Unsigned Warranty Card….smells new! This has THROBAK PICKUPS which as you likely know makes this a premium model. NO – There are no repairs or structural issues. Just some touch spots that are barely noticeable (SEE THE PICTURES FOR A COMPLETE SPEC/CONDITION SHEET). 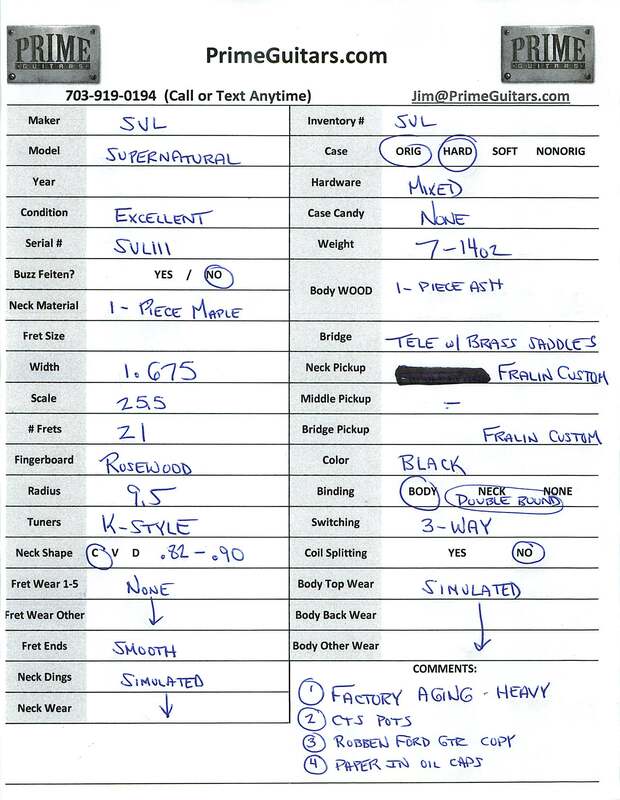 The neck is a wonderful “C” profile that measures .865″ – .967″ and has what appear to me to be Medium Frets. The pickups are THROBAK SLE-101 Plus MXV versions and are original to this custom guitar. I just love the top on this guitar. It shows so 3D in different angles yet the finish is subdued so it doens’t scream out like a circus beacon. We LOVE Collings Guitars. Everyone loves Collings guitars. BUT…when you can get their super EARLY ones….you need to JUMP on them. These were made with amazing woods from the stash. You just simply can’t find the same today no matter what lengths you go to with Collings. They are still amazing…but the early ones are collectible and desired. When the history books are written on this Golden Age of Lutherie…the early Collings will be amongst the ones that continue to rise in price and desirability. 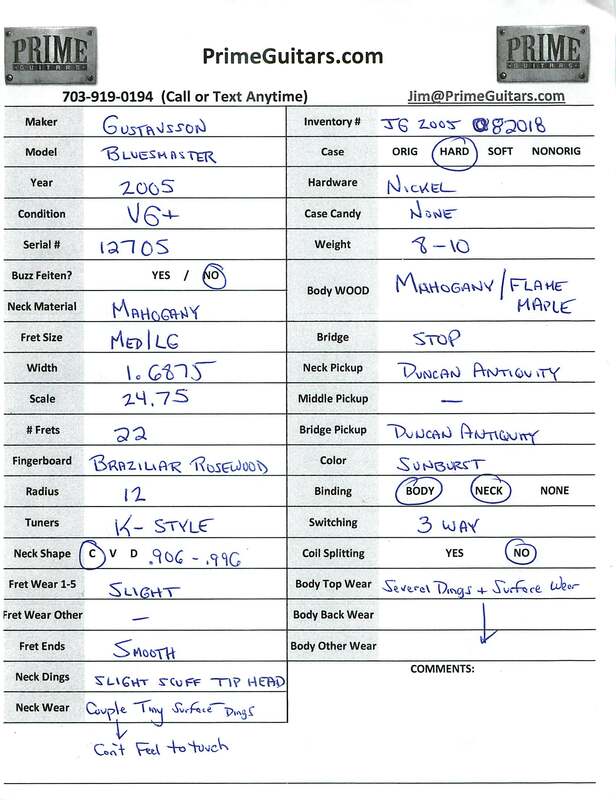 This 2007/8 model is in EXCELLENT nonsmoking condition. It features a 1-piece Mahogany Neck & Back with an incredible Flame Maple Top. The weight is just 8lb-2oz. It comes with its original hardshell case (these were not Ameritage at this point). The nut is 1.70″ and the frets appear Med/Lg (with no substantial wear). Neck is a familiar “C” Shape that is .865″ – 1.00″. OH OH OH and the board is (of course) BRAZILIAN ROSEWOOD. You can grab a classic for the price of some stamped out average guitar. Treat yourself to a classic. 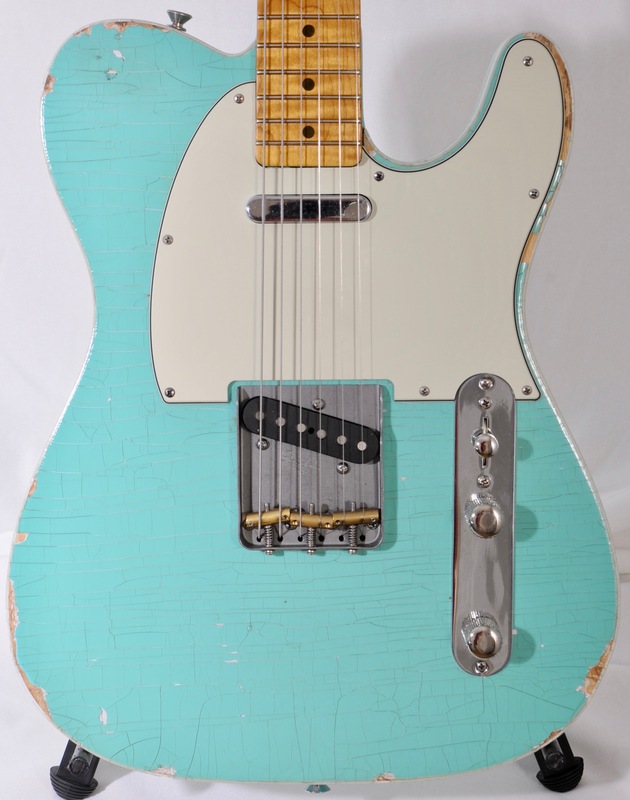 Impossibly rare Glendale Double-Bound TELE! This guitar features a 1-piece AAA Flame Maple Neck that is LARGE at .99″-1.02″…sort of a Soft V profile. It just resonates till tomorrow. The specs are otherwise familiar with a 1.65″ Nut width, 6105 Frets, 25.5″ Scale, 9.5 Radius and K-Style Tuners. The body is Ash and finished in a NITRO and features factory aging to allow you some ‘oh I didn’t just bang it’ comfort. The pickups are a Lollar A3 GVCG in the Neck & a Mare 0038 in the bridge. Of course there is a Glendale bridge. Tonally this one has a wonderful fundamental tone that is extremely even. The low E has a nice ring to it and doesn’t mud out. What I LOVE about the guitar is how it has some nice snarl and can push an amp if you want. 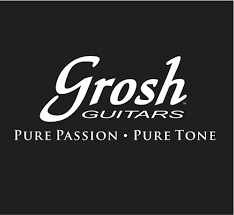 These guitars are one of the best values in the market new…USED they are steals. 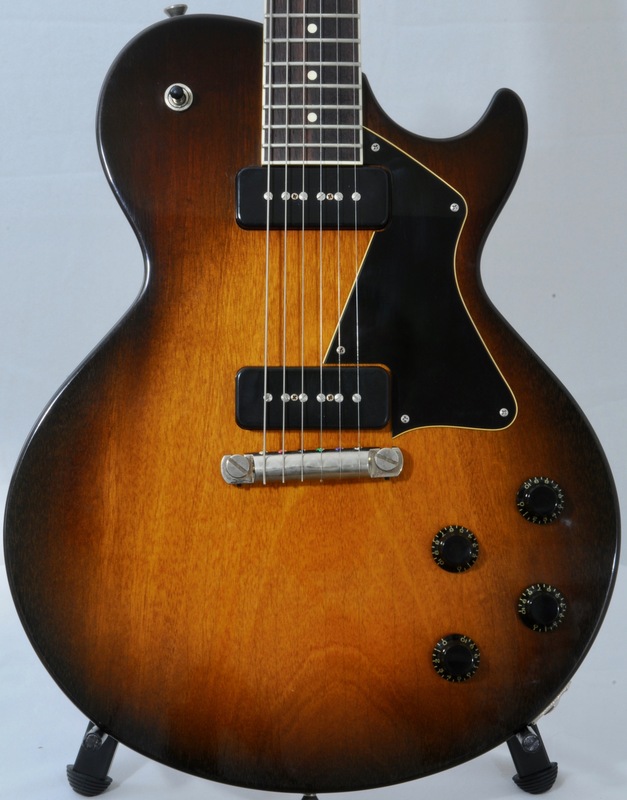 A true classic collectable Gibson Les Paul. 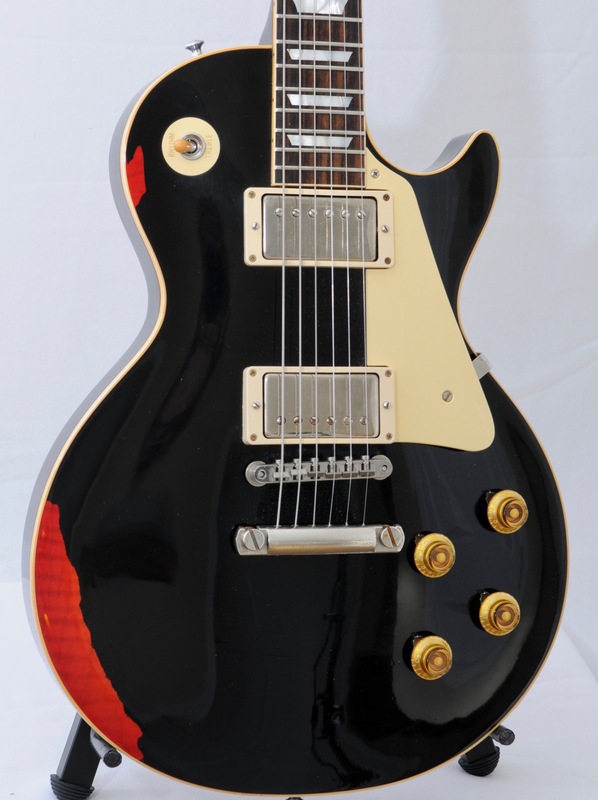 The early 1980s Heritage Series is known as a benchmark in the LP arena. Quality woods. Tim Shaw Pickups. 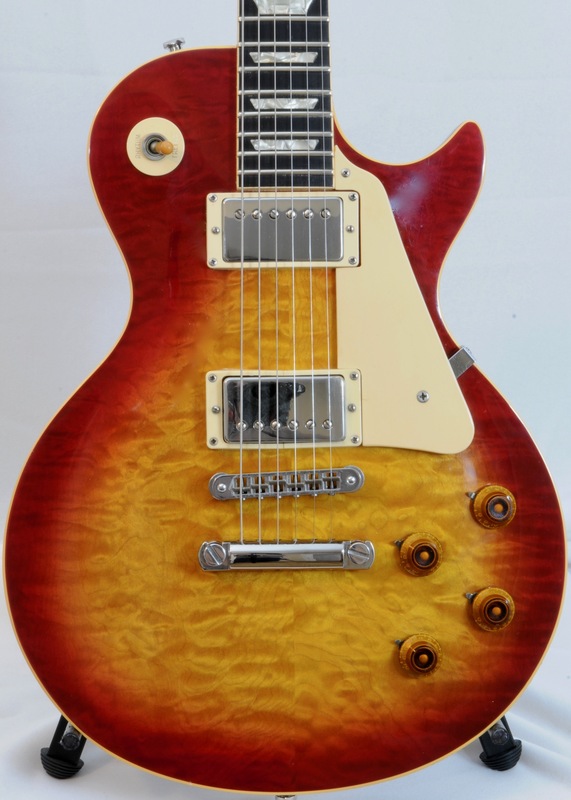 The best of Gibson since the 50s till that point and beyond. These guitars tend to be a bit beefier in the weight because Gibson was using good dense woods. Tonally this is like getting hit with a midrange tank. VERY full sounding and musical. Definitely not the thin shrill sound of so many LPs you’ve tried and flipped. This one is in Excellent “-” Condition with OHSC. 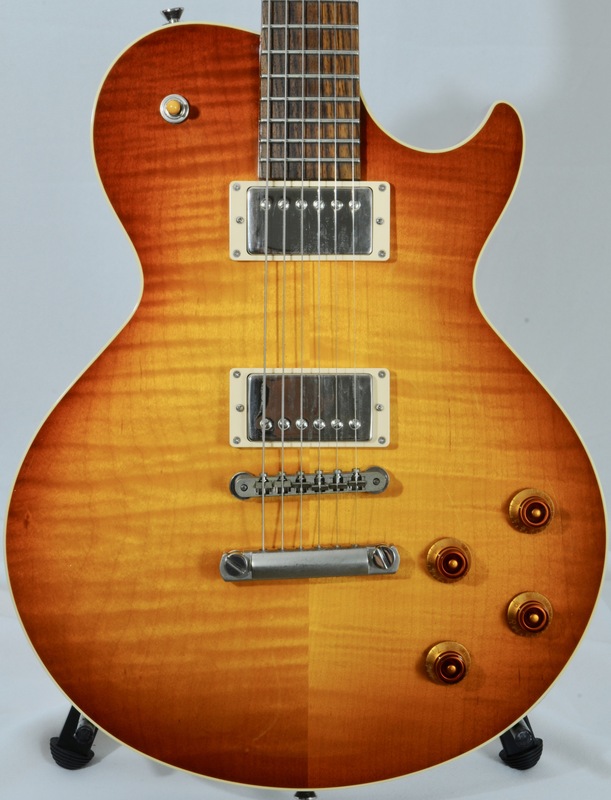 The neck measures a nice .86″-.97″ which is just a tad smaller than a typical ’59LP. Ebony board gives some snap to compliment the dense mahogany used with the maple top. Grover tuners are my favorite on LPs. They are smooth and hold their place. A touch of some fretwear that a luthier could knock out if it bothers you…it doesn’t bother me so I leave it. Really the ‘wear’ to note is typical contact touch/rub wear. There are a couple of very minor surface pinhead dings but nothing serious & certainly no structural issues. If you want a LP that sounds full and fat & you want to capture that classic LP tone…this is the one for you. 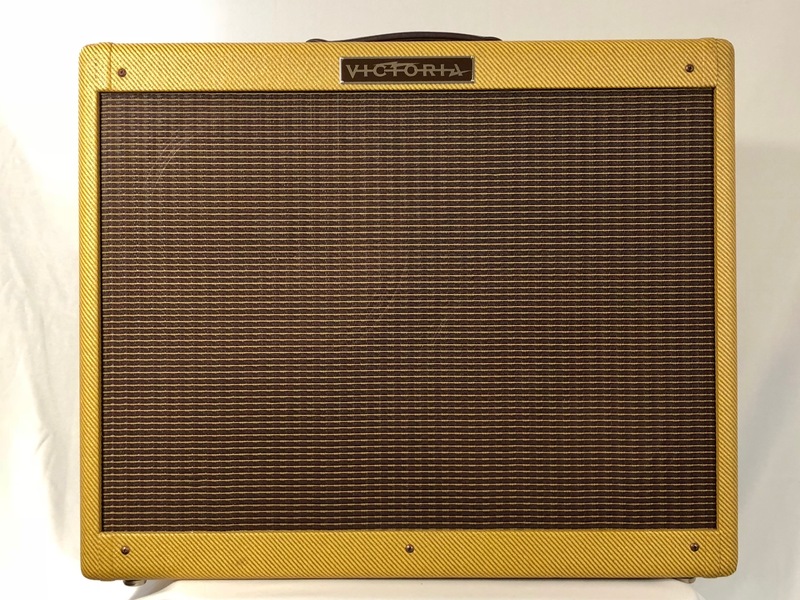 Victoria Low Powered Tweed Twin. Excellent nonsmoking condition. Just a small scuff or two shown. Looks near new and smells it too. These amps are simply amazing. They get SOOOOO close to the originals. I have a genuine ’58 Tween Twin (high power) and I have to say it is really hard to tell the difference between this and the vintage amp. Honestly if you tossed in NOS tubes and old speakers my guess is this might even sound better. Save a good amount of cash vs. a new one. Tubes have very little life on them and are the originals. No repairs. No issues. No mods. No stories. Just a great amp at a discount. See my feedback. I sell clean gear at great prices. I am a store not some fly-by-night who is looking to punt his troubles to you. mpossibly Rare PETE CORNISH SUPER FLANGER in excellent nonsmoking condition with box & power cable (no instructions). YES THE SEALS ARE UNBROKEN. Works as it should and BOY it is the CLEAREST and most LUSH and USABLE flanger ever made. I own one in my personal collection and it does so much that I actually use this to replace my chorus too. There is a reason they are never for sale. 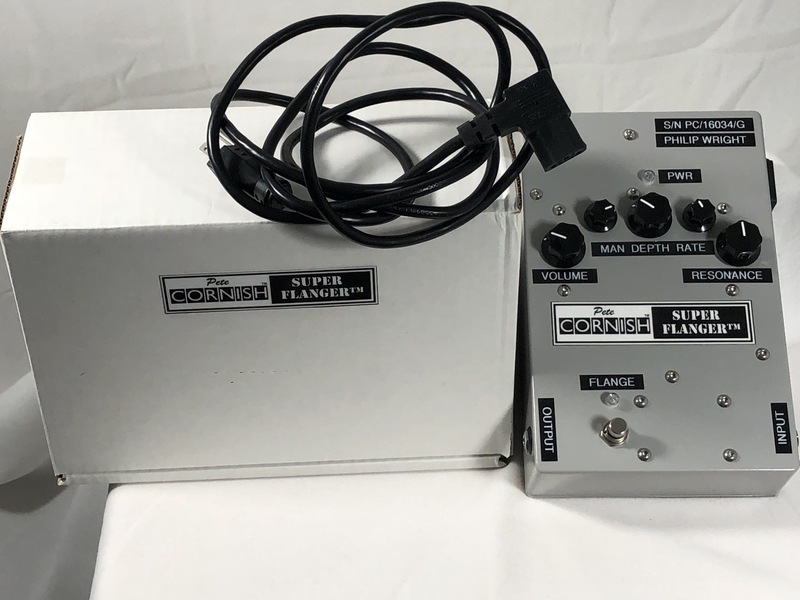 Step up and get the best….you will spend it over time messing with $300 pedals 20 times over and losing $100 every trip. Learn from my mistakes. Comes ONLY with what you see here. Works as it should. Ready for your love! Yes! A super clean 1964/65 Fender Stratocaster with Original Hardshell Case! Ok now that we have those obvious questions out of the way let’s chat. 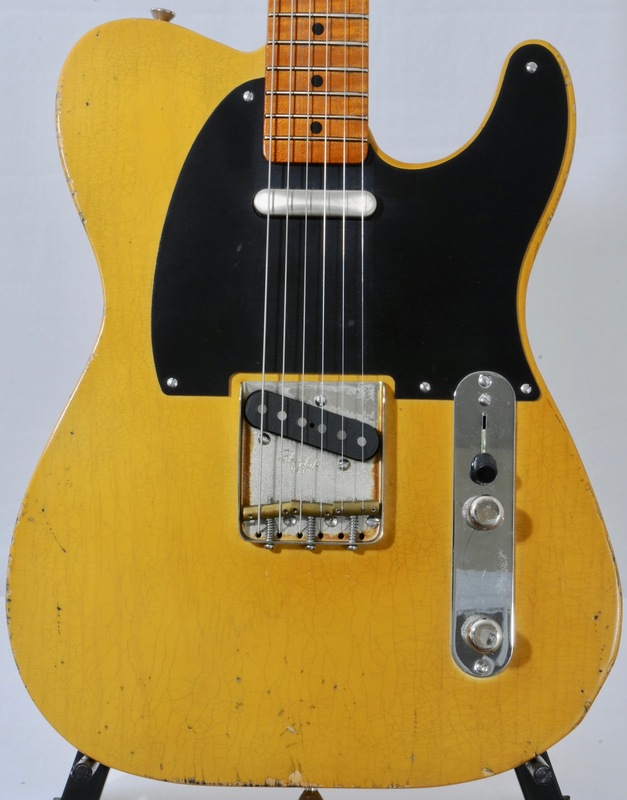 This one has a very late 1964 neck and very early 1965 pickups (first 1/2 Jan 1965). Call it what you want. Some say ’64…some say ’65. The pickups are all original and not rewound. The color is amazing and clean. Some wear, yes, and dings but a super clean instrument for this era. The frets are in exceptional shape and I can’t even find grooves. It weights just over 7.5 lbs which is in the sweet spot everyone is looking for. You can see it was used sparingly. I have a LOT of pictures and happy to send them if you are genuinely interested. YES it blacklights. The guard appears original as does the wiring and pots. Use your own judgement because it’s sold AS-IS and I’m not getting into a debate over every screw on this. The TREM ARM IS INCLUDED…best I can tell it’s original. Decal is original. AMAZING BALANCED PICKUPS! That mid-60s Tone you are searching for! 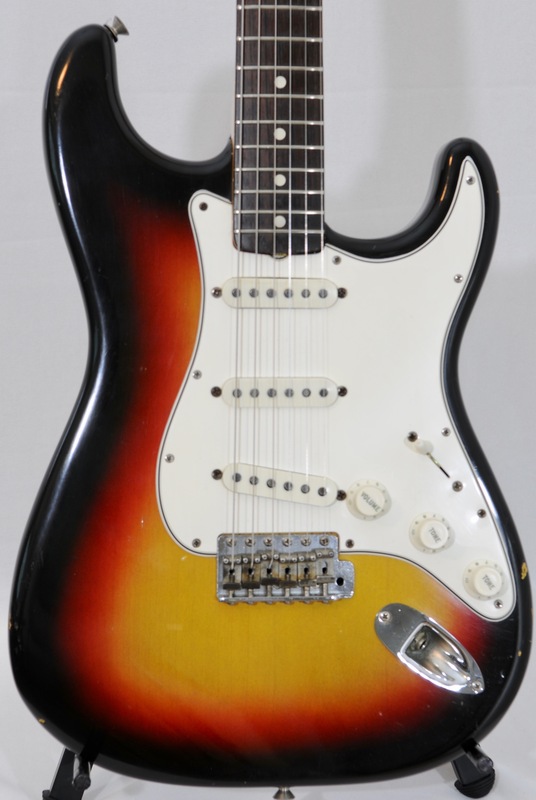 Plays just like a great mid-60s Strat! Doesn’t smell like smoke either! If you’re going to spend money you should search for one that is this level of clean. The premium for “mint” guitars just is too high PLUS you won’t play them. This one has just a couple of wear spots that allow you to enjoy it WHILE maintaining the fact that it’s in this echelon of clean. I have to say these old strats are everything you could ask for. LOVE the carve. LOVE The pickups and how responsive they are. They bloom and sustain. Jangle yet can thicken up with a cranked amp. There is a reason people covet these. And again, this is one you can play AND collect. 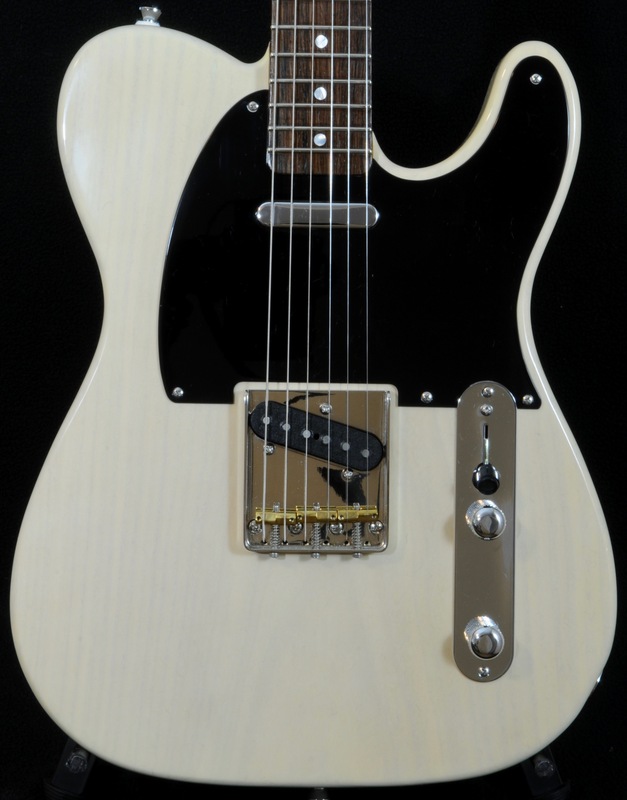 2016 SVL Carved Top “Telecaster” created by a 1-man shop in Europe “SVL Guitars”. 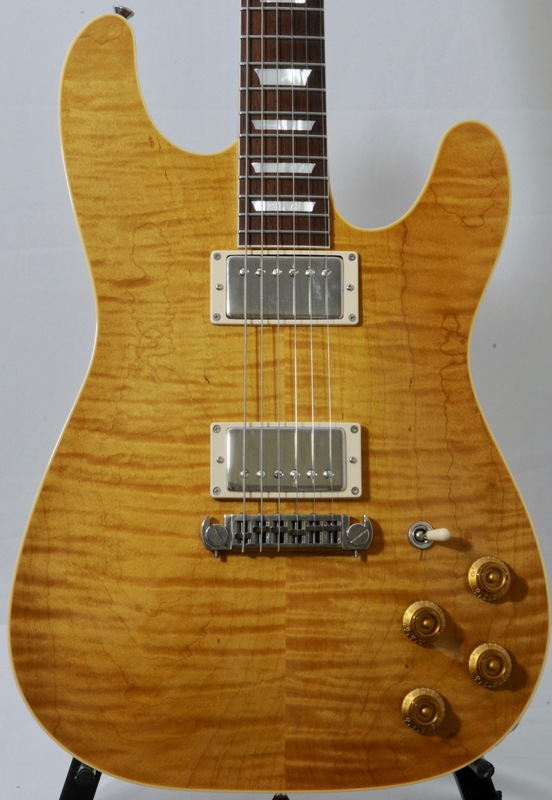 How amazing are SVL Guitars?….well…Robben Ford had one made and plays it (see my other listing for an exact copy of his by SVL). These are coveted in the US and rarely available. I was lucky enough to score a couple and now I will strive to continue finding them…they are THAT good. 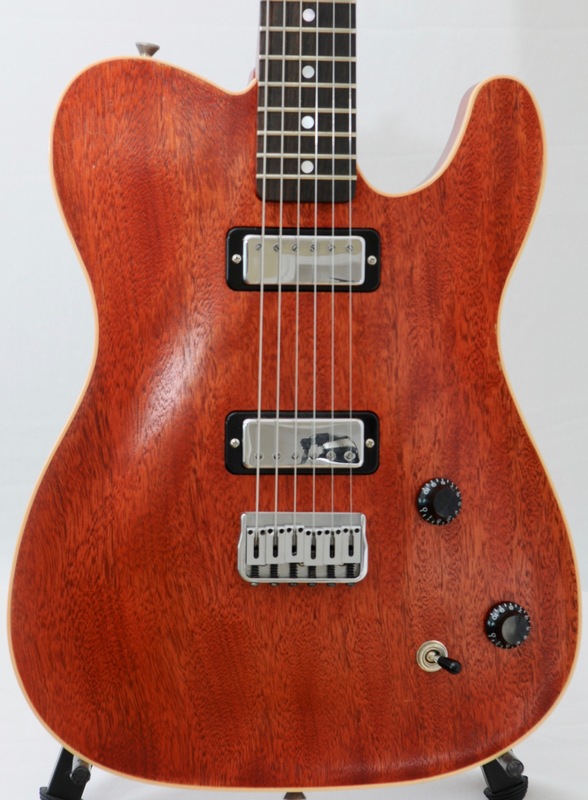 This one features a 1-piece Honduran Mahogany body that is HAND CARVED. The 1-piece Honduran Mahogany Neck features a perfect C-neck profile measuring .85″-.90″. The frets are 6150 and they have no wear. The scale is 25.5″ and the nut is 1.67″. BRAZILIAN ROSEWOOD BOARD (try getting those now!). AMALFITANO MINI HUMS….wow just loaded with P90-esque tone without the hum. JUST 6lb-1oz! Original Hard Case. 10″ Radius in case you care. PAPER THIN nitro finish that feels like bare wood. Tonally you will conjure up the feeling of that perfect LP Jr meets Firebird meets LP. Overall the condition is clean and smoke free. 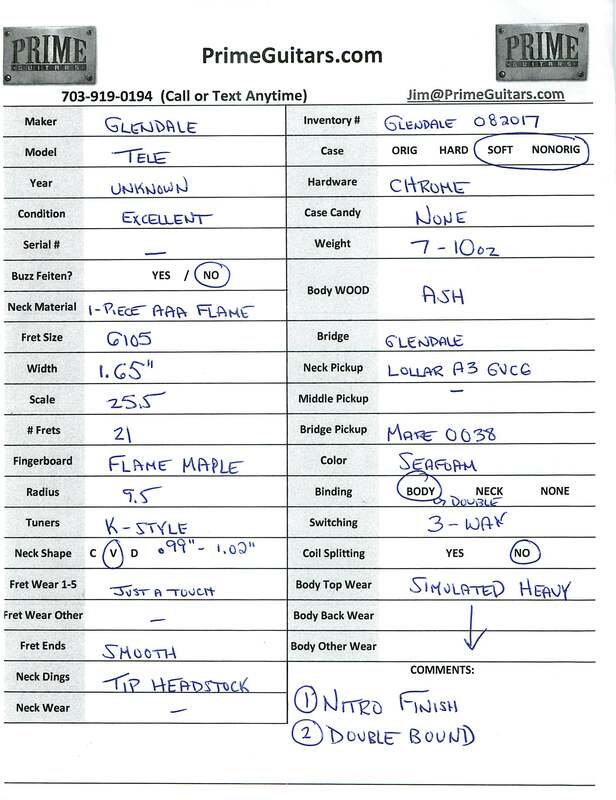 SEE THE PICTURES FOR A SPEC/CONDITION SHEET WITH ALL THE DETAILS YOU SEEK. Collings 290 w THROBAK PICKUPS & NECK BINDING. 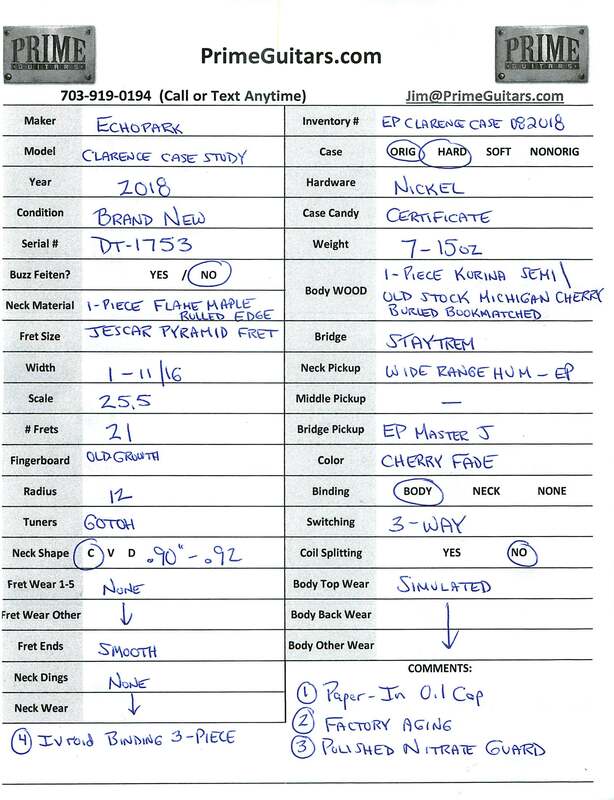 This is a NEAR Mint Condition 2018 one-owner, smoke free piece with Unsigned Warranty Card & Orignal Ameritage Hard Case. NOTE: THIS GUITAR COMES WITH FACTORY CONTROL COVERS IN CASE – OWNER INSTALLED CLEAR CONTROL COVERS. 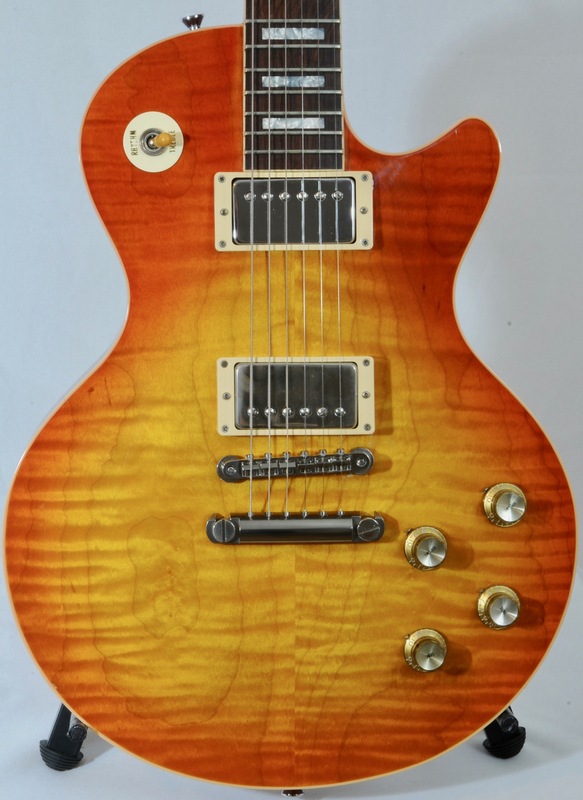 Why would you pay in the mid-$3ks for a guitar when you can save $1000 or more on one that is as nice as those hanging in the showroom (often nicer because those are banged around by morons who have zero intention of buying). Collings CL with DELUXE features! This is a Mint Condition 2017 one-owner, smoke free piece with Unsigned Warranty Card & Orignal Ameritage Hard Case. 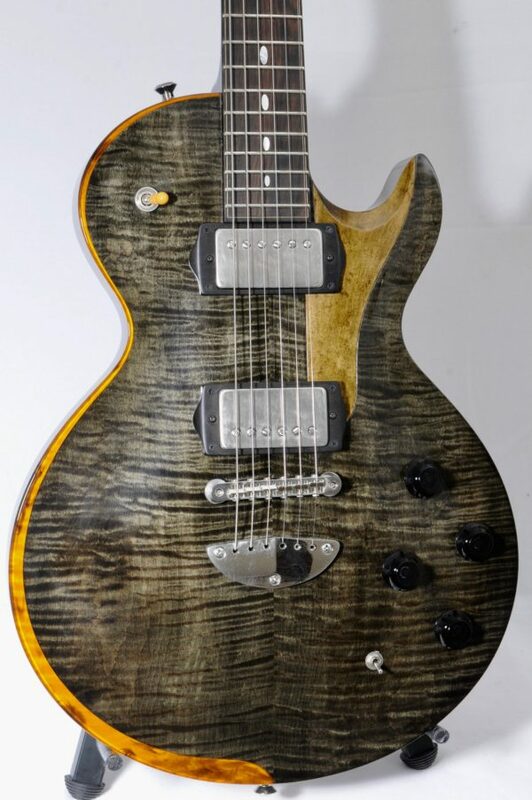 Why would you pay in the $5ks for a guitar when you can save $1500 or more on one that is as nice as those hanging in the showroom (often nicer because those are banged around by morons who have zero intention of buying). At PrimeGuitars (dot com) we (ok just me) search for the best instruments made. It’s how I started. Back when the internet first allowed guys like me to learn about things other than F or G brand products. It was fun learning and hunting. It was and still is very much like the vintage guitar hunt (only harder). The goal has always been scour up guitars that improve upon the mass produced…OR…hand select that one mass produced piece that stands out. Well…I found SVL. Simon makes each and every instrument himself in England. He has been a touring pro & a repairman for decades…having been through every type of guitar imaginable. 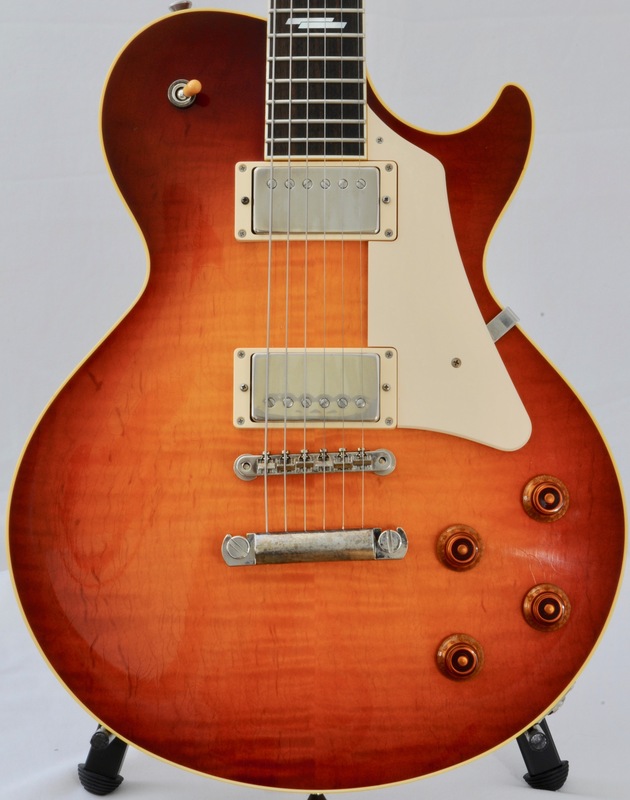 How good is his work?…..well…Robben Ford owns & plays a SVL custom created to his specs…..interested now? THIS piece is an EXACT copy of the one Simon made for Robben. Not team built…not CNC….hand made. It features a 1-piece Ash Body. 1 Piece Maple Neck. Paper In Oil Caps. CTS Pots. Fralin Custom Pickups. Rosewood Board. “C” Profile Neck measuring .82″ – .90″. ‘factory’ aging. Original Hard Case. DOUBLE BOUND! You can see all the specs & detailed condition if you flip through the PICTURES. Guitars like this don’t come around very often. THIS is one to pay attention to. People ask me ‘what’s the closest thing to a Gustavsson’…well, this might just be it….and 40% of the price too! Hand crafted one at a time. OLD growth woods. Custom shaped necks. Hand inlaid bindings. Painstakingly created by one person. For years I have heard the legend of Probett. They are hard to find. They are kept by their owners. They are coveted. FINALLY I have laid my hands on one. Let me tell you that my mentors were not wrong on this front. Think of playing the finest Gibson product from days gone by…..NOW envision that in a much more ergonomic “F” style format. BINGO…you get it! This 2015 Probett Rocket features a 1-piece OLD GROWTH HONDURAN mahogany body & a flat sawn Curly Eastern Maple Top. Mahogany Neck & an Amazonian Rosewood Board. 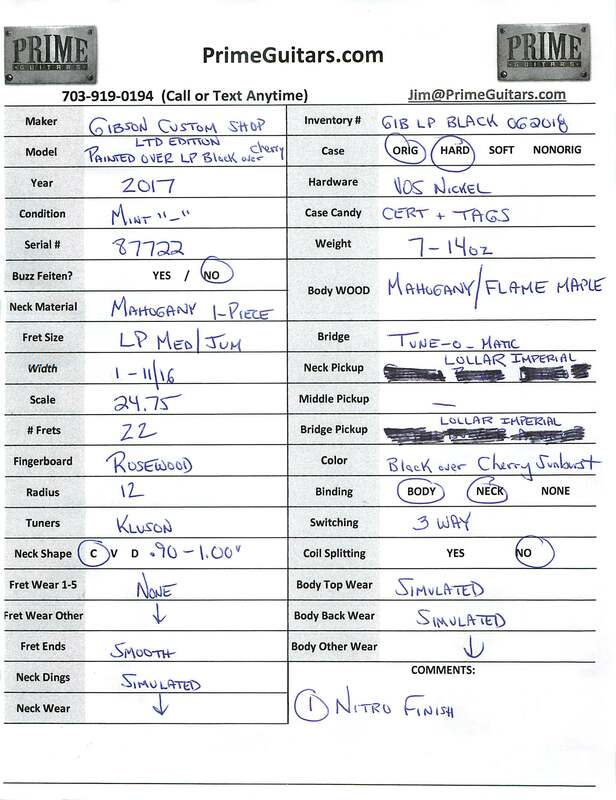 The neck specs are just about dead on a ’59 LP (.88″ – .95″ and a C profile). 24.75″ Scale & 1-11/16″ Width. Of course it is a bound neck. I LOVE the Gotoh K-style tuners. Let’s face it…tuning a F headstock is a lot easier in the dark than a G style. The weight is a WOW 7lb-15oz. Custom hand wound Bulldog pickups. Light aging is included at no cost to you (LOL). 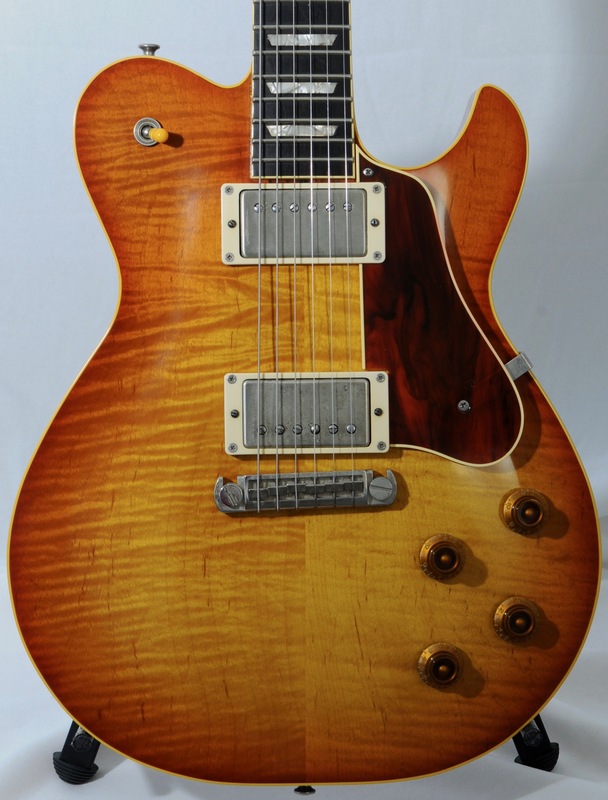 Tonally…just that tight fat responsive LP you wish FENDER made (or Gibson for that matter). The notes are clear and not mushy. The guitar sustains and notes bloom. THIN nitro finish. This FEELS like a hand created OLD guitar. This isn’t one of those ‘photographs well but is underwhelming’ pieces. This is upper echelon. GENUINE Trainwreck JM Creation. This handwired head is a special edition LOW WATTAGE Liverpool that puts out a very usable 18w. 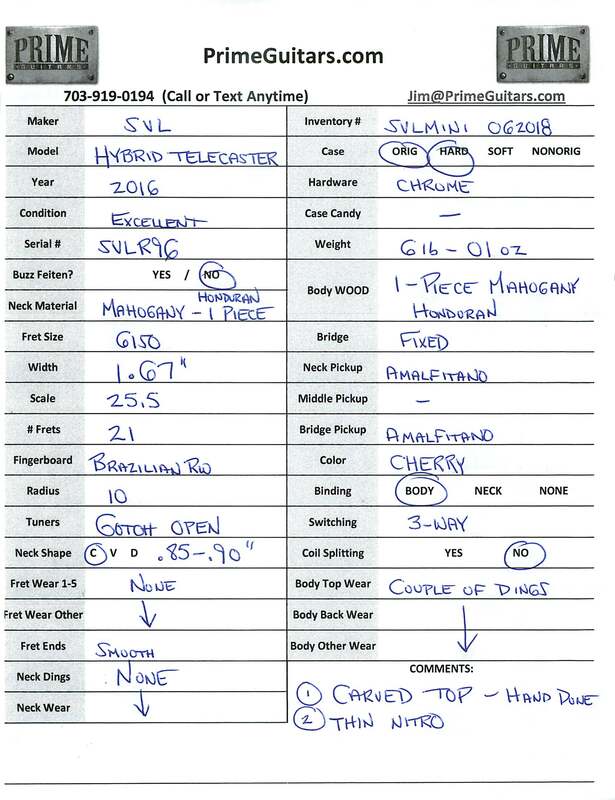 It features builder selected NOS Tubes and a custom Exotic Wood Cab. 1-Owner, nonsmoking and works perfectly. This Wreck is NOT a clone. IT is a genuine Trainwreck product. There is something about a genuine Trainwreck that clones/replica/recreations can’t touch. They have note bloom like nothing you have ever experienced. They clean up with a simple rolldown of your guitar’s volume knob. This LOVES Single Coils & Hums. It is responsive to new and old speakers. This EL84 version, the Liverpool, walks the line between a EL34 Wreck and the chimier EL84 Rocket. This has all the girth and spit with nice chime when you dial back the guitar volume. The EL34 has a very thick clean tone and less top end when overdriven. This is the PERFECT balance. 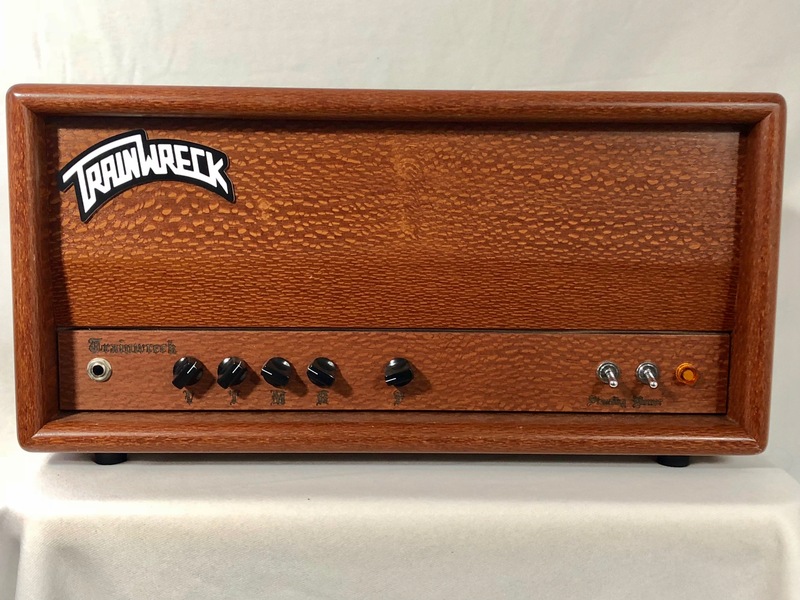 Toss out what you thought you knew about amps….a Trainwreck is THE standard for a reason. 2017 Glendale Telecaster “Retro Blackguard” in Near Mint condition. This is a 1-owner piece hand selected at Charlies Guitars a few months ago then traded to me. It was ungigged and lived in a nonsmoking environment. It comes complete with it’s original thermometer case & Certificate. This instrument features a 1-piece Sugar Pine body and a 1-piece Hard Rock Maple Neck. Together, it weights JUST 6lb-08oz. You will just LOVE the soft-V-to-C profile neck and the factory aging to make it play smoothly and quickly without sticking or that annoying ‘do I take the finish off myself’ nagging question. The pickups are the 1949 set. They are amazingly open and allow the inherent warmth of the guitar to come through. 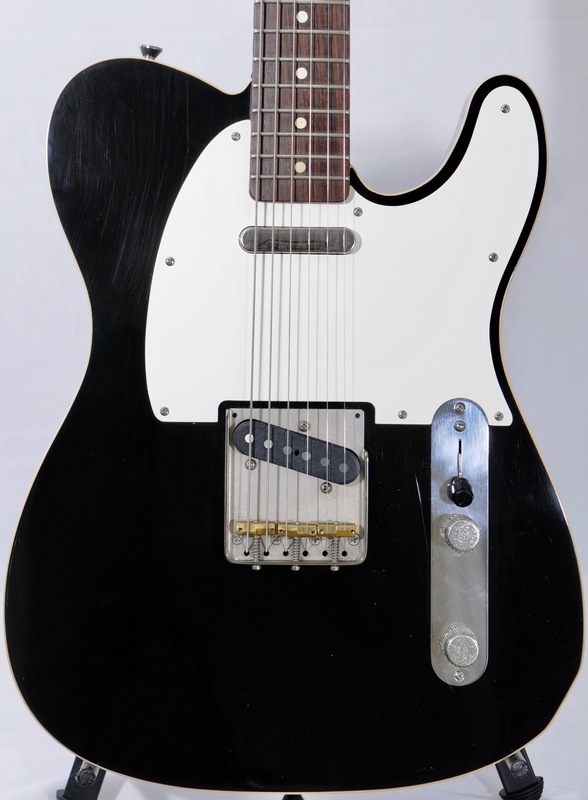 This is not a harsh tele. Very snappy with a clear warm bottom end. Maybe it’ss the Nitro finish?….maybe it’s the Paper-in-oil tone cap? Whatever it is you will absolutely fall in love with it. The original owner picked it over everything in the store….and he has a hoard of teles …what’s that tell you. 2017 Gibson Custom Shop LES PAUL Painted Over Series. Mint “-” Condition with Original Brown Aged Case, Cert & Case Candy/Tags. This is a 1-owner piece traded in from a non-gigging, nonsmoking home player. Just a few hours on it. This was HAND selected because it weighs only 7lb-14oz. There is no fretwear and I can’t finds anything that appears to be ‘user’ related wear….just the factory aging…and can I just say this aging is as good as the Murphy aging. Fantastic. Wonderful piece. PICKUPS HAVE BEEN UPGRADED TO LOLLAR IMPERIAL: SORRY ORIGINALS NOT INCLUDED (Didn’t receive them). 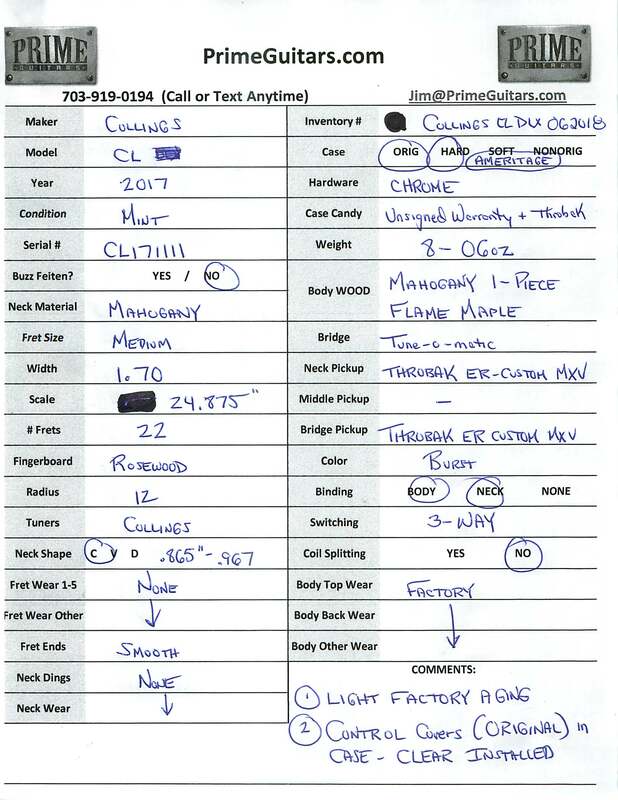 You can find all the Specs & Detailed Condition if you look at the pictures (see the attached sheet). Ken McKay “G” Explorer! Old Growth KORINA and hand bench-made craftsmanship. 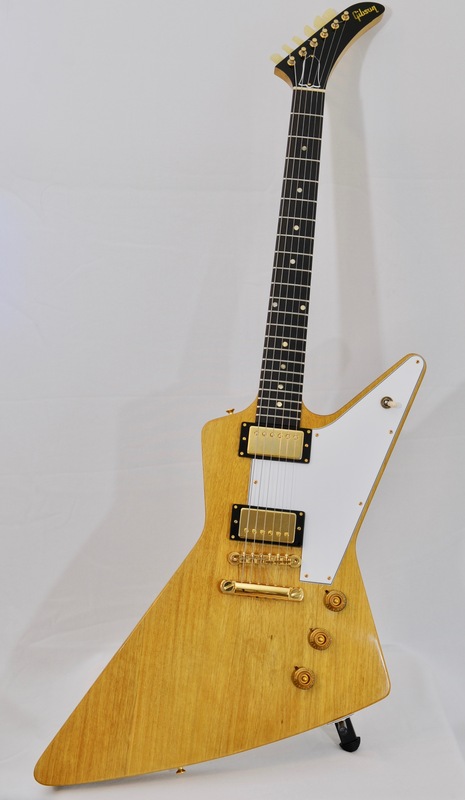 You will be hard-pressed to find any Explorer of this quality and tone for this price. I have had a LOT of korina guitars. 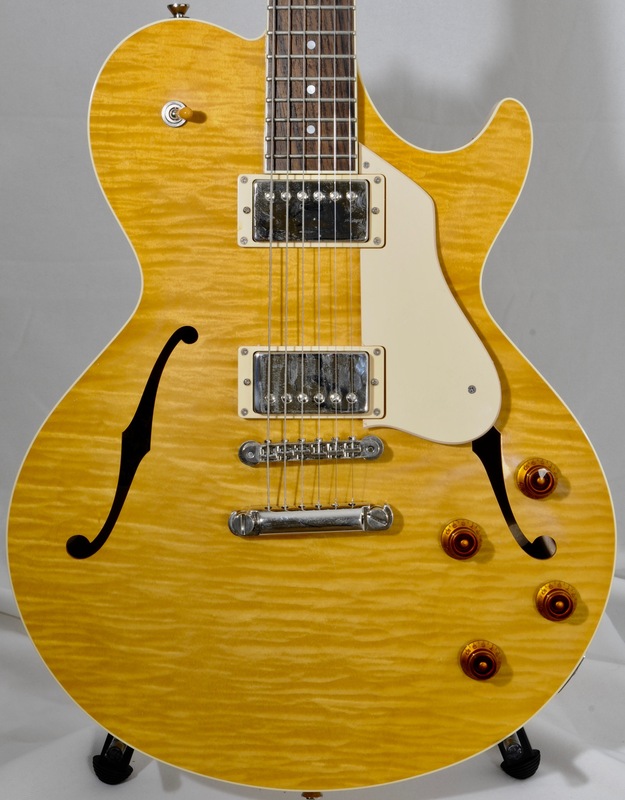 Most have a scooped tone…very few have the magical Midrange bump…THIS guitar has it. The instrument sounds thick and fat like Missisippi Queen or your favorite classic rock. 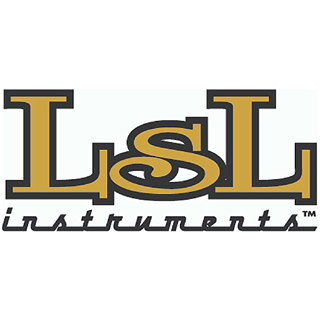 Nothing sounds like a great Explorer…they have that tightness that a LP can lack. They have the fullness that nothing else can bring. They also retain the high end that the other slab guitars often lose. This piece weights just 7lb-13oz. 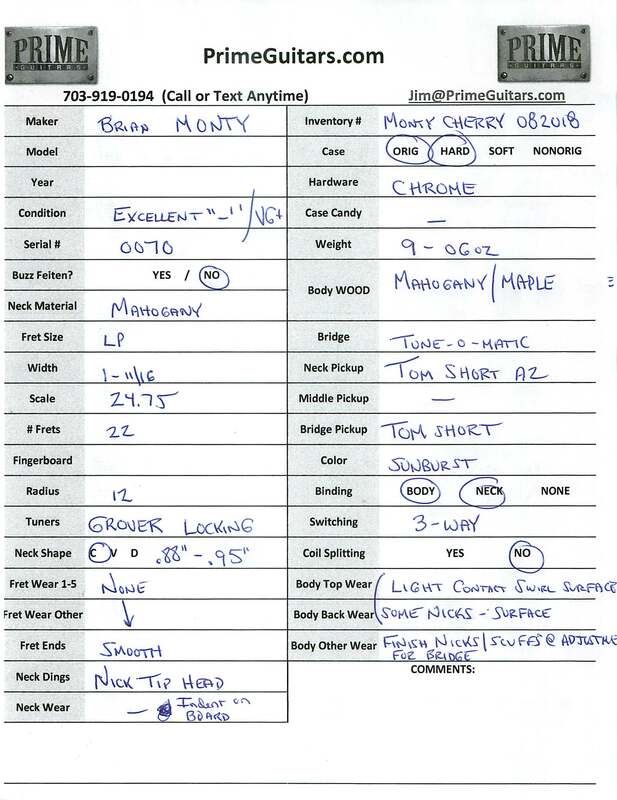 It has typical “G” specs including 1-11/16″ Width & 12″ Radius. The frets are in near perfect shape with no grooves or noticeable wear. The neck is a wonderful “C” profile typical of a Gibson. The measurements are .91″ – .91″. Very slight factory aging plus a touch of user imparted light surface wear. Comes with a mean and tough original hardshell case. 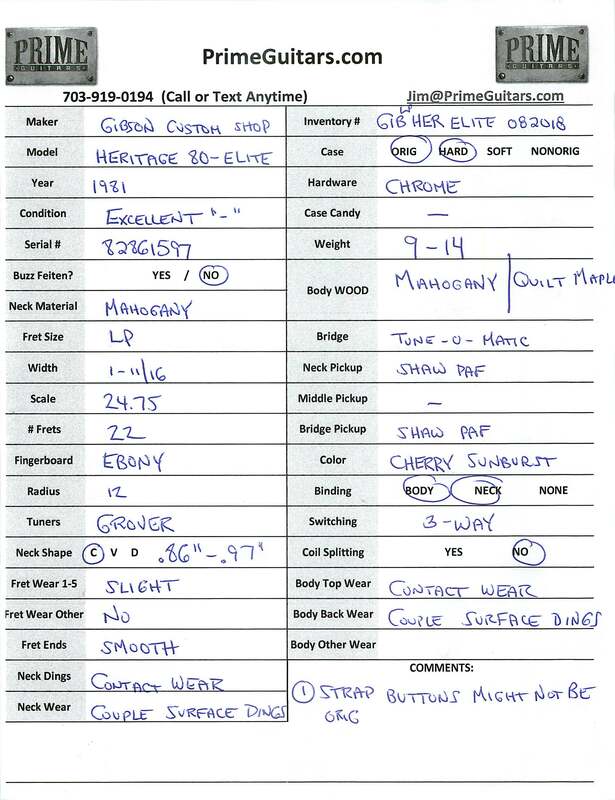 You can see all the Specs & Detailed Condition on my SHEET in the PICTURES. 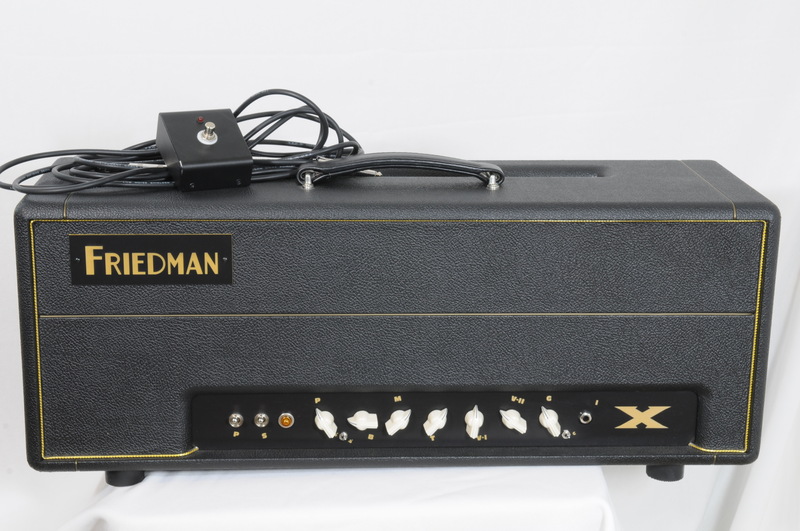 FRIEDMAN Phil X 100w Signature Head. In Excellent Nonsmoking Condition. Comes with footswitch AND YES IT COMES WITH THE POWER CORD. Fantastic clean condition. I can find one or two tiny little things but it looks and smells like something you would bring home from the store. One owner. Nice thing about MY store is it’s internet only….so it doesn’t sit here for everybody to try. I have to say this is THE most flexible head I’ve played. You can literally dial in vintage to modern. I A/B/C/D’d it vs everything from my ’67 Marshall through my Bogner Twin Jet. Not as brutal and modern as the Bogner….BUT…it virtually nails the old Marshall through Silver Jubilee and more. I freaking love this. It plays so well with vintage cabs like my ’68 Marshall Cab w old Celestions. It also LOVED my Diezel front-load cab with modern Celestions. 2-12 or 4-12 no worries. New these are a lot more. Grab one with a tiny bit of touching for a LOT of dead Presidents less. 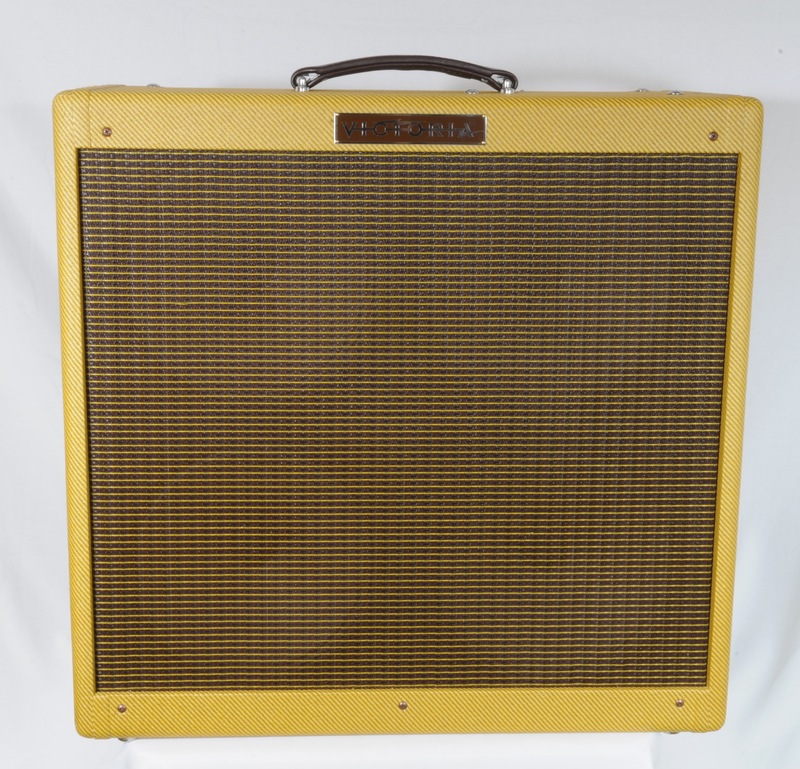 WOWZA….impossibly rare amp here! Got this from one of my best friends who hunts down the unobtanium. 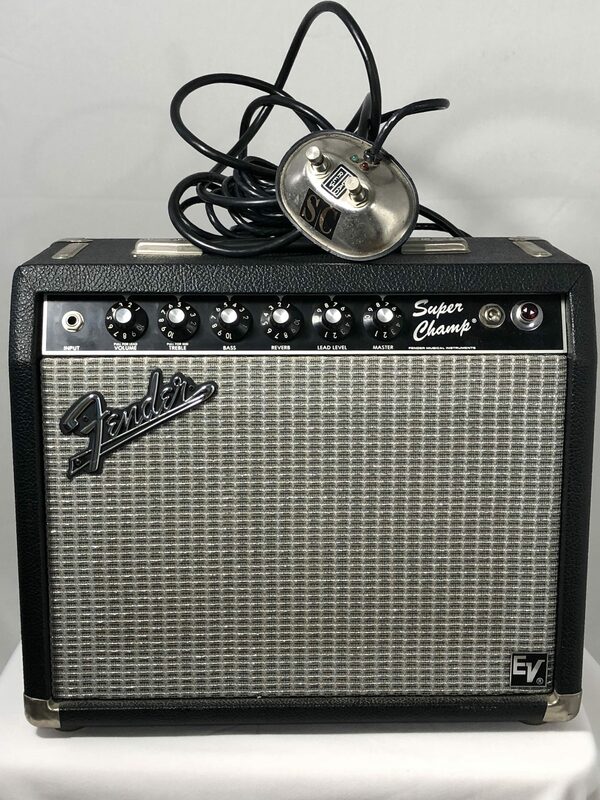 FENDER Rivera Era SUPER CHAMP….this is an extremely limited edition EV Series with a custom EV speaker! You love a champ…cool…you need a super champ,…I get it….You love Rivera era…you should…..OH you like ev’s…then you NEED this. It doesn’t fart out or sizzle out due to speaker fatigue. This amp has a LOT of gain on tap and the speaker can handle it….thus the series. I have to say it is hard to find an amp of any size that can go from Fender sparkling clean to midrangey gain to searing gain back to on-the-verge overdrive. Just a LOT of amp. Totally a desert island amp for most people. AND it’s built to stand the test of time. It is like a cynderblock! Works as it should with no issues. Clean and from nonsmoking environment. Comes ONLY WITH WHAT YOU SEE HERE.